Standardize your inspections across the board with Inspection Arsenal™ METRIC Pre-packaged work holding kits. Select from 50 to 138 pcs. to create universal, quick-swap inspection fixturing! 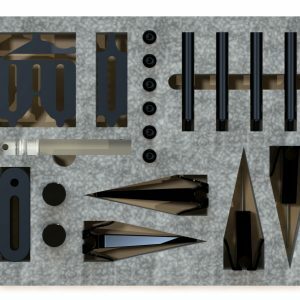 This kit is a sampling of components perfect for all traditional CMM’s. Fast trigger-action, non-marring, low-profile, no tools or messy tape and glue. Full kit includes everything you need to inspect most any part… Fast trigger-action, non-marring, low-profile, no tools or messy tape and glue. 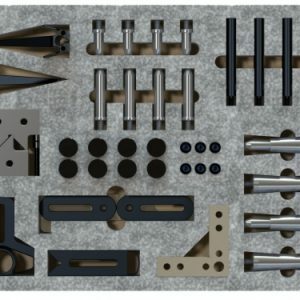 The “Works” Holding Kit is a combination of components found in other Workholding Sets. Includes The Stand-Off & Rest Pad Set, and the Enhanced Stand-Off Set. 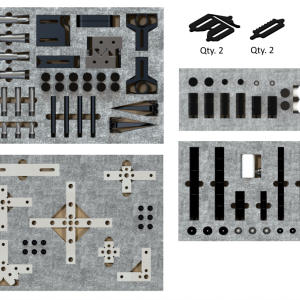 This kit contains everything you need to create several fixtures across multiple CMMs. 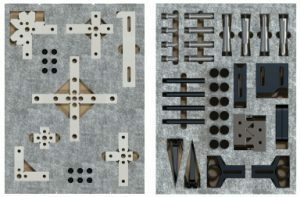 OPEN-SIGHT™ for Vision Work holding kit includes hold-downs, hole adjusters, clamps, and stops . Use with clear polycarbonate plates for lean Vision fixturing for Vision inspections.